Mike and I have been on a huge vegetable kick lately. We must be growing up or something because all of a sudden, we can’t get enough vegetables. When I was a kid I don’t remember eating vegetables at all; I think the only vegetables I ate were carrots and potatoes, which don’t really count as leafy greens. I’m pretty sure a piece of lettuce never passed my lips until I was 10. It’s funny because now I love snacking on vegetables – give me a bunch of greens and I’m a bunny. Were you one of those kids who didn’t eat vegetables? I didn’t eat much of anything aside from plain white rice and cereal. I’m really not sure where I got all my nutrients from. Oh wait, I remember also being obsessed with Flinstones vitamins – those were the best! Zucchini on the other hand, when I was a kid, was definitely not the best. It was, much like eggplant in my books: slimy and weirdly textured. Now though, I can’t get enough of eggplant or zucchini. I find that the trick with zucchini is to not overcook it. Zucchinis are naturally pretty watery and if you cook them down too much, they turn into watery mush. This applies to all zucchini, but especially so with zucchini noodles. They really don’t need too much heat, all you want to do is soften them a bit. 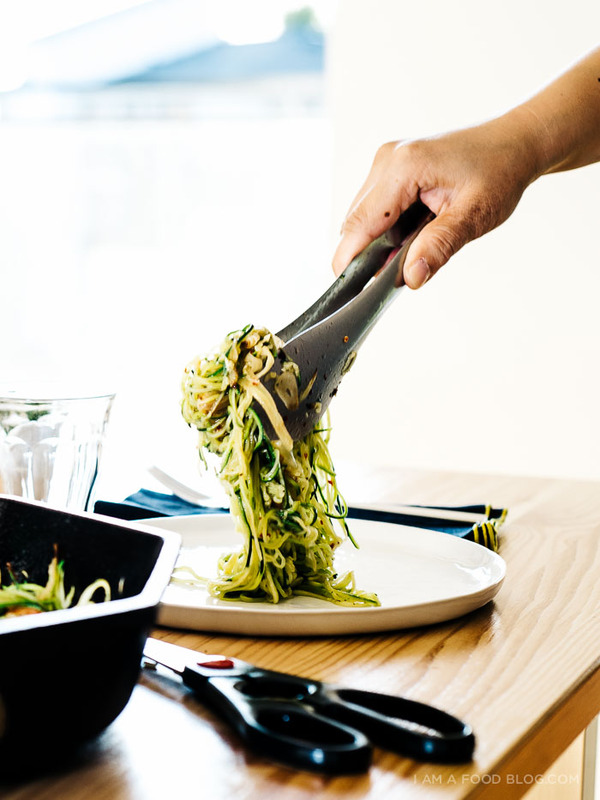 Zucchini noodles work awesome in this recipe (I made my zucchini noodles with this spiralizer), but this recipe works with pasta too, if you’re carb-loading. I found this gem of a recipe in last month’s Bon Appétit, which happens to be one of my favorite sources for inspiration. The original recipe called for linguine and squid, but I swapped both out for zoodles and shrimp. There’s some quickly caramelized fennel, thin slices of lemon, lots of crushed red pepper, and a punchy, herby cilantro and fennel frond garnish. It was the perfect indulgent, yet light summer evening meal. I’m loving the late summer evenings and long lingering dinners that go along with. Heat 1 tablespoon of oil in a large skillet over high-heat. 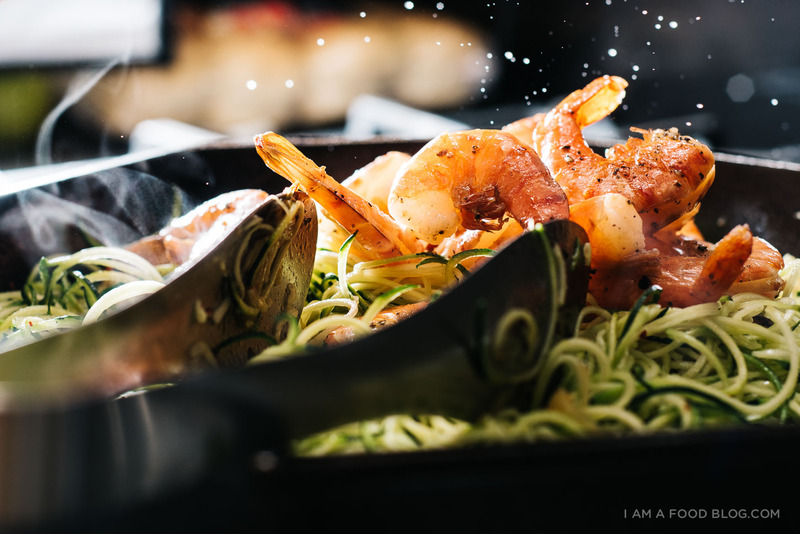 Add the shrimp, being careful not to crowd the pan, and cook for 1-2 minutes per side, until slight charred, pink, and cooked through. Season generously with salt and pepper and remove from the pan and set aside. Reduce the heat to medium-high and add the remaining tablespoon of oil. Add the fennel slices and cook, stirring occasionally, until golden brown and soft, 10-12 minutes. Add the garlic, red pepper flakes and half of the lemon slices. Cook until garlic is soft, about 2 minutes. 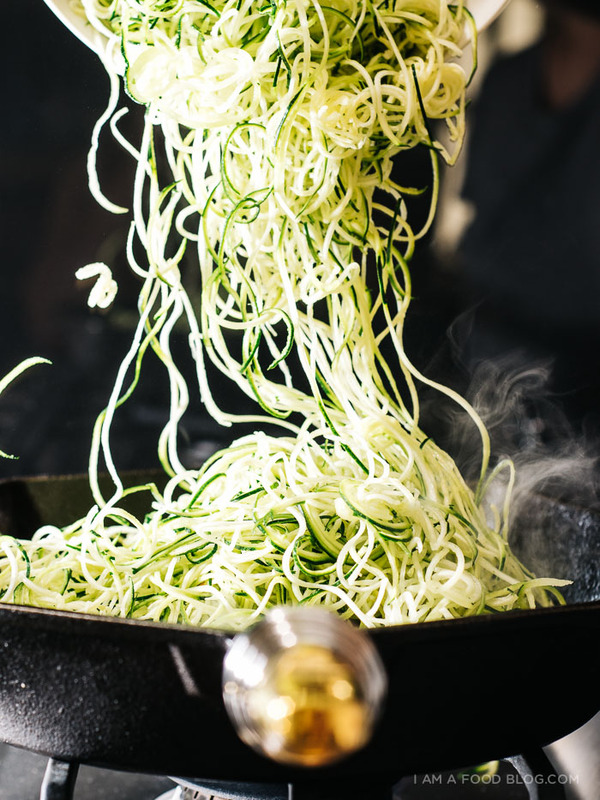 Add the zucchini noodles, season generously with salt and pepper, and cook, tossing, until tender and cooked through, 2-3 minutes, depending on thickness of zoodles. 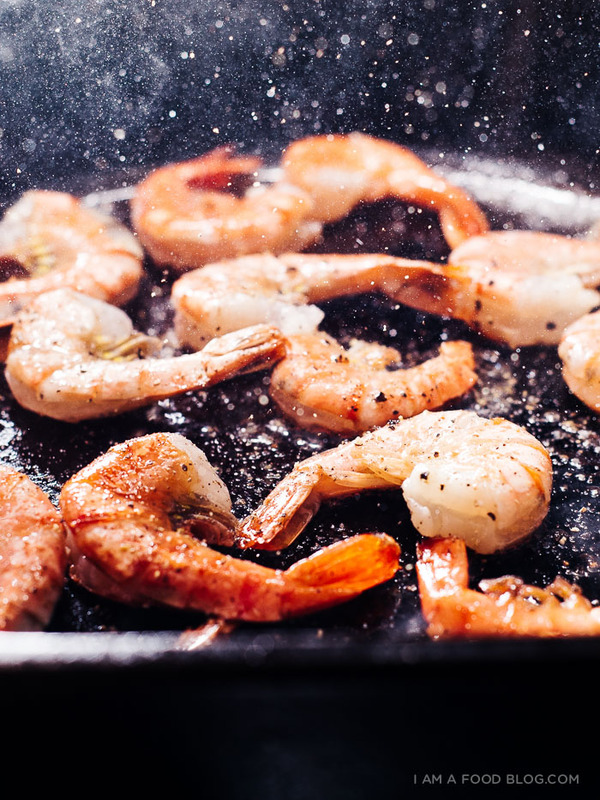 Add the shrimp back into the pan and toss to combine. In a small bowl, toss the cilantro, fennel fronds, and remaining lemon slices with a drizzle of olive oil. 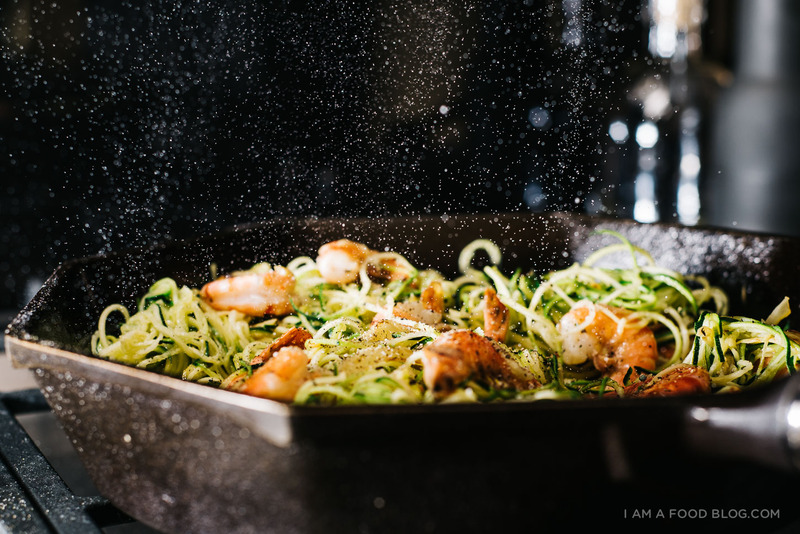 Season with salt and pepper and serve on top of the shrimp and zucchini noodles. Any time I hear the words “spicy shrimp,” my first instinct is to drop everything and come running. i was one of those weird children who loved fruit (even the ones i was allergic to), and who knew what kale and chard were as an 8 year old (the first meal my brother learned to cook was pan-fried tofu with kale and rice). this was mostly my mom and her sisters’ doing, though being in california probs had something to do with it. i just got into caramelized fennel, which sounds like it would be so tasty with all that garlic and shrimp and squash. 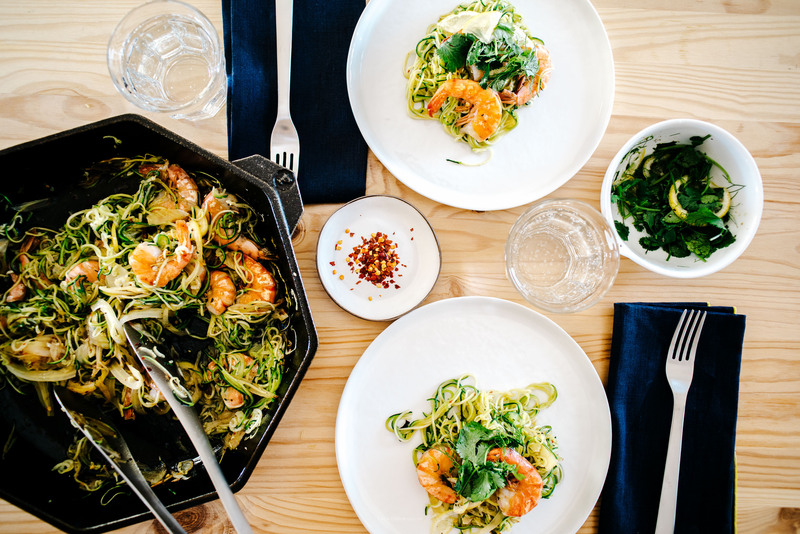 and this shrimp zoodles do sounds good! This looks so fresh and delicious! 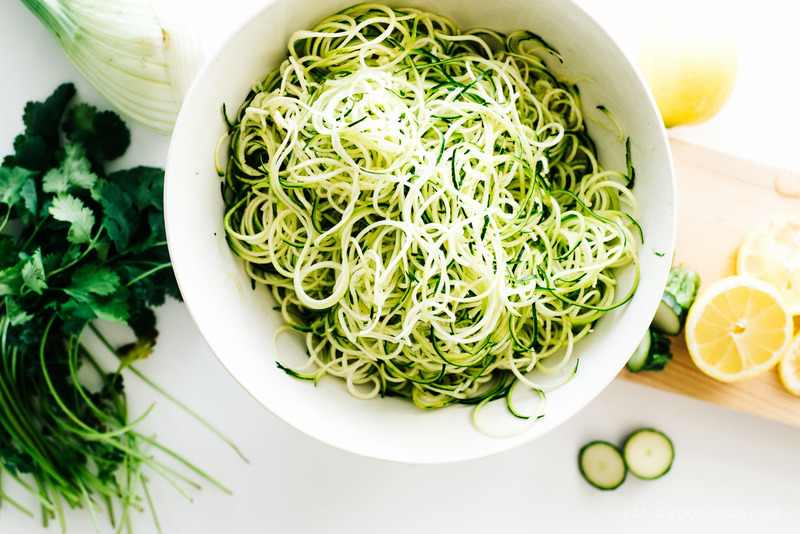 I’ve never made zucchini noodles before – do you have a recommendation of spiralizer? 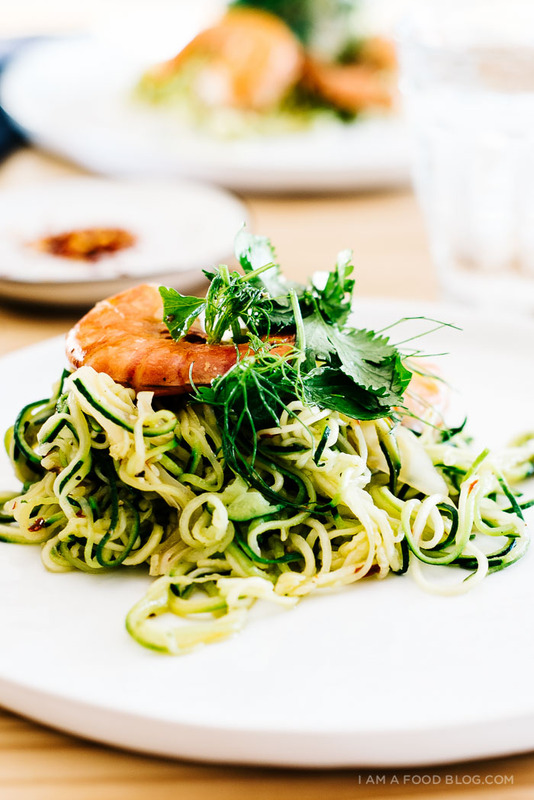 So there are a lot of recipes for zoodles on the internet, but yours is the first that actually makes me want to try them! Stunning all around! 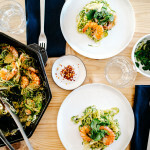 This looks fabulous and I love that you used zoodles. 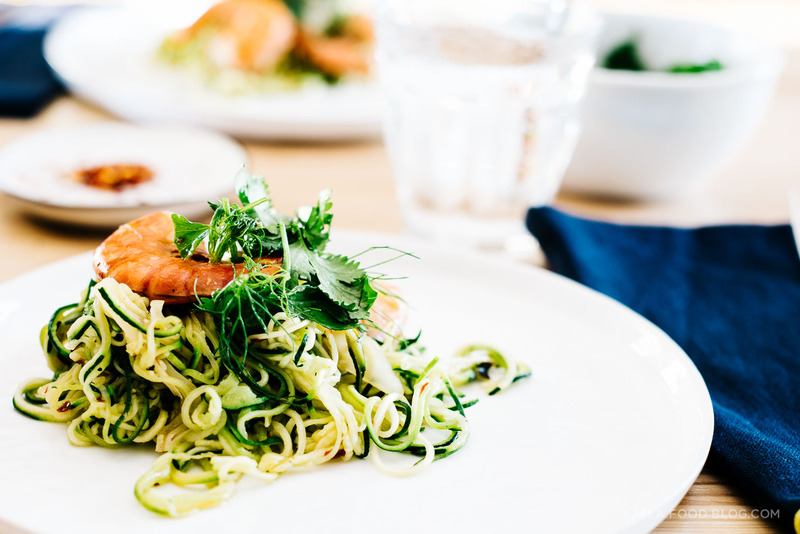 I’ve really gotta get me a spiralizer because I’m dying to try this recipe! YUMMMM. I think one of my favorite memories from last week is eating all the iceberg lettuce with you at WFM!! I pretty much love everything about this dish but especially love the caramelized fennel. I don’t know what it is about fennel, but lately I’ve been loving it in all the things. Also, your zoodles look extra yummy! Oooh – my Whole Foods just started carrying green and yellow squash “noodles” in their prepped veggie section. This sounds like the perfect excuse to try them out!!! This looks right up my alley! Think it will find its way onto my menu next week! And I agree about cooking zoodles too long; they do turn to mush! BTW, I love your photography! Do you have Mike put the seasonings on and you take the photo when they are mid-air? It’s a very cool technique however you do it! Have a great weekend! I’ve taken a break from zucchini noodles bc for like four months that’s all I ate, day and night, but this might be da recipe that brings me back! Your blog is gorgeous! The photography is amazing and the food looks even better!! I’m a new blogger and I just posted a recipe for homemade shrimp sushi. Would love it if you checked it out! First thing first, your photos are amazing! I was seduced. 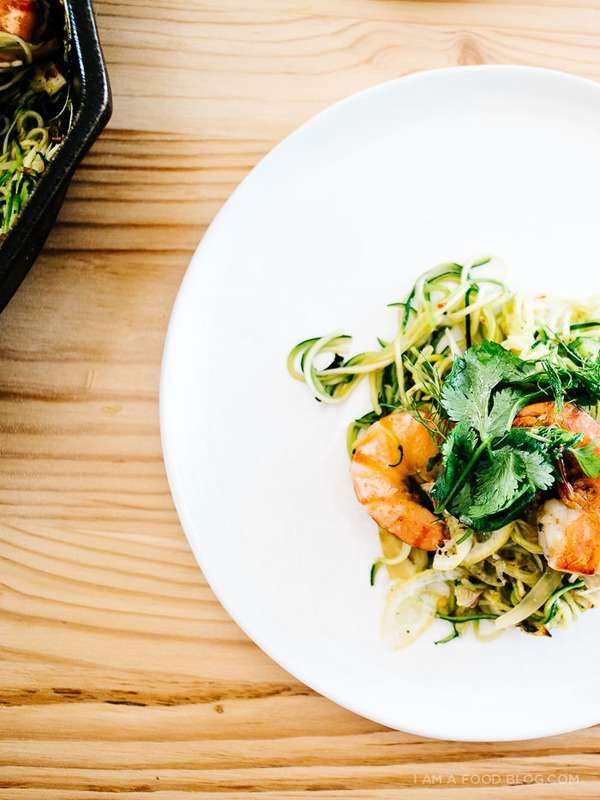 Can’t stop thinking about this fantastic zucchini noodles. So elegant, an art to some extent. I definitely in love with it. Stunningly beautiful! Cooked it and it came out perfectly! Husband and I loved it and will make this one of our go-to’s, thank you! This looks really good and those two pictures of the sizzling shrimp and noodles next to each other are really beautiful!